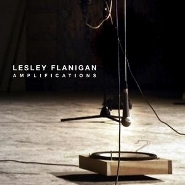 Lesley Flanigan‘s voice is so beautiful that you can often lose track of the often thick, crusty, feedback-laden, speaker-mangling sound that accompanies it in her recordings and performance. 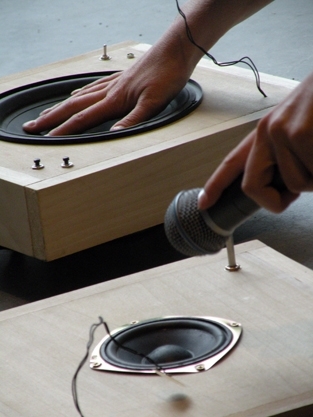 Flanigan layers her voice to suggest an angelic choir, all the while her handcrafted “speaker electronics” emitting waves of broken white noise. One fine example is “Snow,” off her 2009 album Amplifications. The track begins as little fissures of sound — along the lines of the aural glint that occurs when someone plugs in a guitar — and her voice doesn’t appear for some time, which allows the listener to focus on the rich tones, the beading pulses, and the sine-wave counterpoint (MP3). More on the project at lesleyflanigan.com. Very glad you enjoyed it. She’s pretty amazing, indeed. I saw her play late last year at Grey Area, that new gallery in San Francisco’s Tenderloin neighborhood — between the looping of her voice and the crackling noise of her speaker devices, it was just tremendous. I preferred the bit without the voice, but overall an extremely lovely track.